Imagine being face to face with God and hearing Him speak to you directly in audible words. Moses had just such an opportunity. 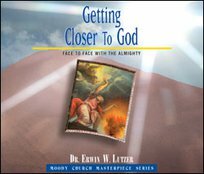 In this study of Moses' life and ministry, Dr. Lutzer guides us to a better understanding of who God is and how we can know Him more. Note: Some of the messages were originally preached in 1993; the series was revisited in 2004 and new messages were added to the previous series.